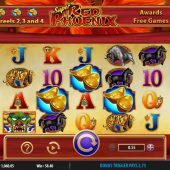 Super Red Phoenix slot is perhaps unsurprisingly another low-pay multi-line slot emanating from Scientific Gaming's developers, which also include Nextgen, Barcrest and WMS. This normally spells a dull and predictable slot as we saw with Bally's Wonder Woman Bullets and Bracelets edition - we seem to have lost the thrill of the older classics like the Quick Hit Platinum slots so is there any hope here? We have some gentle music to playing as we spin and the Phoenix rises from behind the reels which are the only thing not red here! This mythical bird rises from the ashes, so let's hope these won't end up consisting of our bankroll. 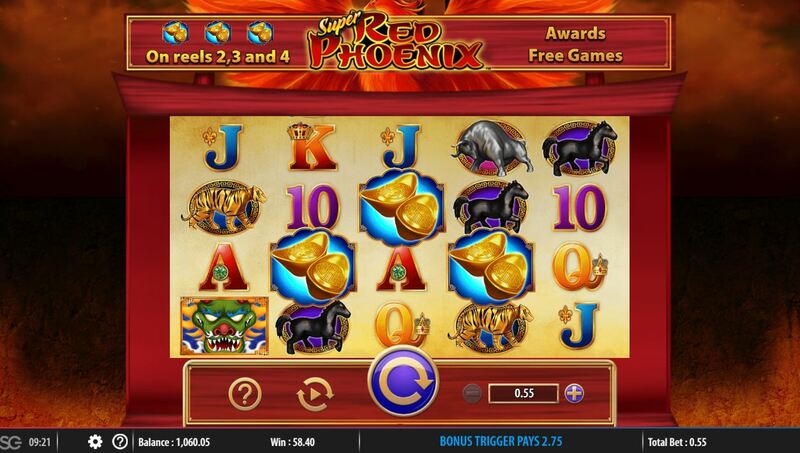 We have 40 paying lines on Super Red Phoenix slot over 5 reels of 4 rows. Symbols are stacked which is fortunate as the line pays aren't great by any means and we must pay an odd 55 coins to spin on those 40 lines too. The 5-of-a-kind pays are Phoenix Wilds at 100 coins, Totem 100, Tiger, Buffalo and Bear 75, Horse or Ace 55 with four more card values all paying 25 coins for a full line of 5. This may look bad but there's other ways to improve the pays aside from the stacks. On all reels this stacked Wild can appear and it's an expanding one too, but not in the way you expect. It will expand laterally to the left and right along the rows it covers, so for example one landing full on reel 3 will expand to fill all 12 tiles in the centre 3 reels. This is quite simple - see one appear on both reels 1 and 5 in the same spin and you get 100.00 for your 0.55 or about 190x bet. A mini internal jackpot. If you see the Golden Bowls appear on the middle 3 reels you will trigger a choice of free games. You can take 30 with base game pays, 15 at 2x, 10 at 3x or 6 at 5x. These can be retriggered too. This where the expanding Wilds, or Radiating Wilds as Bally call them, come into their own and can lead to some decent totals.